The LM RIBS solution is a compact, pallet mounted (mobile) platform that allows operator access/operation of the press brake as needed. It requires very little floor space and yet offers a huge inbound queue of part flats; can change out the press brake tooling robotically (option), and manage the press brake and automation cell programs through our HMI cell controller (option). 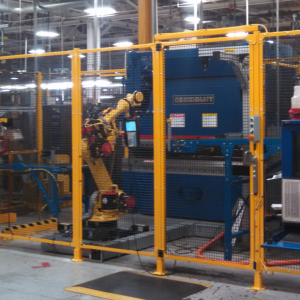 This solution is based upon JMT’s popular “Lean Machine” series of Robotic machine tending solutions. With over 150 of these ‘LM’ solutions installed on a huge variety of machine tools in the past 4 years, it makes a great platform for smaller part bending operations, parts typically 20” square or smaller and weighing less than 10 lbs. each. This solution can and is being used on large tonnage press brakes, but its’ small foot print suits it well for smaller hydraulic and electric brakes also. It is mechanically simple, yet runs JMT’s powerful ‘RIBS’ software that insures reliability, ease of use and high productivity. There is no comparable solution (Rib to Rib) to JMT’s LM RIBS Cell.